We’ve been really impressed with the airlines and service in Vietnam, where three main airports serve this rapidly growing country. Ho Chi Minh City Airport in the South (named Tan Son Nhat International Airport), Hanoi Airport in the north, and Danang Airport in central Vietnam. There are other regional airports such as Hue, but the big three seem to be responsible for the majority of Vietnam’s growing airlines industry. 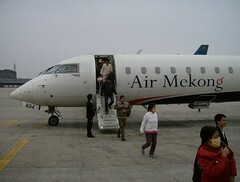 We flew Air Mekong and enjoyed quality service, new planes, and low prices. Vietnam seems to be moving forward in quality ways as they build the national airlines infrastructure needed to support their rapidly expanding economy. Now.. if they can only fix up the roads….